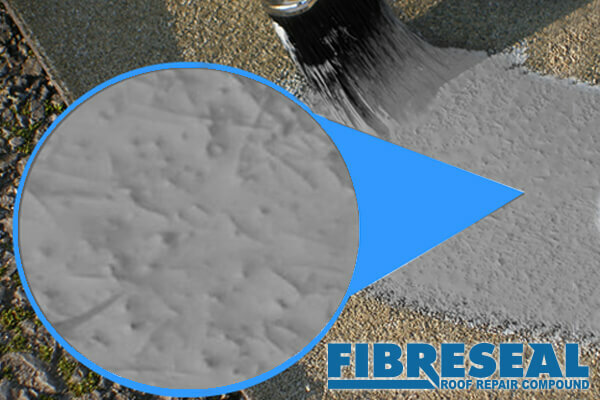 Fibreseal is the instant roof repair compound which you can brush apply in just one coat, even in damp conditions. Developed for the repair and maintenance of industrial and commercial flat roofs, Fibreseal is endlessly versatile. Use to repair asbestos roof sheets, steel profile cladding, felt, and even for lining gutters. Fibreseal is a thixotropic and highly adhesive acrylic resin paste, blended with millions of reinforcing fibres which allow it to effectively bridge small gaps unsupported and larger cracks with fibreglass matting. Fibreseal is instantly water proof and will not wash off if you are caught out by a rain shower before it has cured. Ideal for Flat Roof Repairs, Felt Roof Repair, Asbestos Repair or Metal Cladding Repair. If you own or maintain any of these roof types whether commercial or domestic, Fibreseal is the must-have addition to your tool box. This flat roof repair compound is perfect for emergency repairs and general maintenance. Flat roofing is challenging for a wide range of roof coatings because of standing water, temperature changes and UV degradation. Your flat roof is constantly being exposed to the harsh British climate. That’s why It is very important that that your flat roof is suitably maintained with high quality paints and coatings. Ensure your roof evades expensive splits, cracks, tears and holes. Our flat roof repair compound is easy to apply and can help you avoid costly roof repairs. Even when it is wet, it will not wash away while curing and waterproofs immediately. We have a wealth of experience manufacturing roof repair products, ensuring quality and durability. Used this to patch flat roof. Easy to work with and appears to have done the job. Good service aswell.